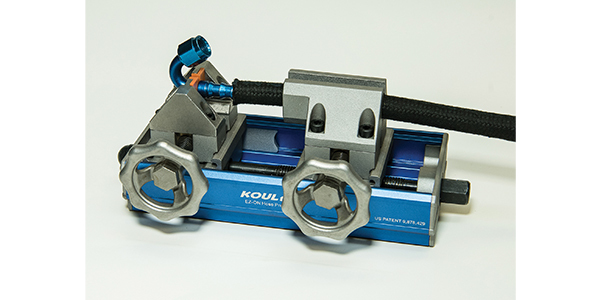 Koul Tools received Patent US 9,878,429 for their new and improved EZ-ON Hose Press—the 409B. Lighter and more efficient, this new model features thrust and ball bearings for smoother operation, a new drive screw and larger nut for improved performance and a traveling carriage with sealed bearings that rolls on a track for better stability. The EZ-ON Hose Press 409B installs both straight and angled fittings from 1/4 in. to 1 in. sizes in mere seconds. It utilizes a stationary vise to secure the fitting and a traveling carriage to clamp the hose. 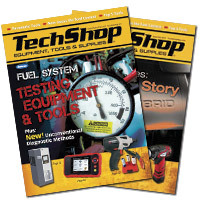 The hose is then easily installed by turning the drive screw with a ratchet or impact gun.